I saw this old postcard on ebay and had to have it. Not the postcard, but I’m lusting the waterfall because it would look amazing running down our ravine. Won’t ever happen but the dream keeps me from thinking about my foot. My foot has been giving me problems so there isn’t much gardening going on. I’m waiting till the weeds are waist high so I don’t have to far to bend, nor will I have to scoot around on the ball of my foot while doing garden squats. I’ll have a lot of clean up to do once I’m feeling better. 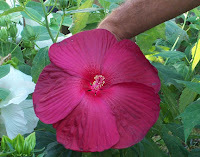 Until then here is a pretty hardy hibiscus blooming that I grew from seed… not all is bad.